UsenetServer is a very good Usenet provider. Amazingly fast downloading without data limit and with a very high retention. All of this for a very low price. And from us, you get on top of that a great discount. UsenetServer offers unlimited speed and the highest retention in the Usenet industry. You get this for the lowest price which means it’s one of the best bangs for your bucks. New! Free VPN service $4.99 p/m. Get VPN (Anonymous Internet) for an annual subscription. No download limit. All UsenetServer subscriptions allow unlimited access. You can maximize your speed with a large number of concurrent connections offered with all plans. High retention. UsenetServer has a massive storage architecture so we can bring you the highest retention! The best value for money to be found there. 99% completeness. UsenetServer maintains partner relationships with all major Usenet providers and most smaller providers, which means you have access to virtually every article posted to Usenet worldwide. Because the storage architecture Usenet Server is fully redundant, we never lose an article once we receive. This ensures a near perfect completion and great reliability. Blazing speeds. The backbone of the UsenetServer network connects more than 800 providers of Internet bandwidth worldwide to multiple Tier 1 bandwidth providers which translate to blazing download speeds! So many Mbit get nowhere as cheap. Free SSL connections. Free 256-bit SSL connections for all subscriptions. SSL encryption helps ensure no one sees your Usenet traffic and that your username and password are safe from identity theft. Furthermore, SSL encryption prevents your Internet service provider from throttling speed. UsenetServer Global SearchSearch through Usenet easily straight from your browser with advanced filtering options. With a yearly subscription, you pay just $7.95 / month for unlimited speed without a download limit. The information above can be used to download with a newsreader. With a cable connection in The Hague, The Netherlands, a constant downloading speed of 300/30 Mbps with only 7 connections used. We have also compared other Usenet reviews. In the review section, you will find several other interesting providers such as for example, TweakNews, Newshosting and UseNeXT. Besides that, we have tested a couple of good Dutch Usenet providers like Eweka and XSNews. There were no problems with missing data and was able to download files older than 3000 days. DMCA takedowns occur as with almost all other providers. Because UsenetServer owns servers in the Netherlands and the US, you can always download with the highest speed. The beauty is that you can experience all this for yourself by testing the news server without spending a penny. 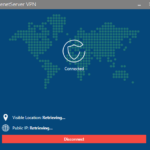 If the UsenetServer VPN is included with your subscription, you can use it for various privacy and security reasons. Besides downloading safely from Usenet with SSL, a VPN ensures you can download safely from any internet source/website. 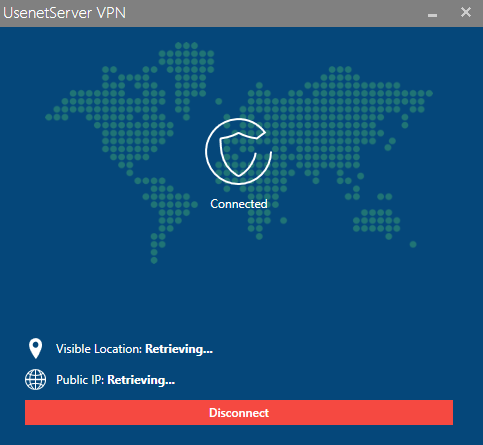 We tested the UsenetServer VPN client v2.0.0 on Windows 10 x64 with the same 300/30 Mbps cable connection. Installation is quick and easy, however, you need to restart Windows after installation. After you launch the application, which starts quickly, log in with your username and password. Within seconds you will be presented with a very basic but pleasing interface. Choosing the protocol type and connecting all happens from the main interface. By pressing the location icon, all servers get pinged automatically, but just once and you will have to restart the application to ping again. You can sort by ping, city, and country. For a few countries, you can select the city, for most countries you can’t. There are many servers but you can’t select them individually. Select a location, press OK and hit that big green Connect button. What’s really lacking is auto-reconnect and a kill switch. It would be handy if the application’s window could be maximized and the specific protocol type is mentioned instead of just the security level. After connecting to a server in Amsterdam, The Netherlands- while downloading and uploading from a server in Amsterdam, we measured a download speed of 264 Mbps and 30 Mbps upload. The second test was performed with the Connection Preference slider set to left (Speed). This resulted in a download speed of 280 Mbps while the upload remained the same due to our limited cable upload of 30 Mbps. As you can see the download speed increased by 16 Mbps. The third test was performed with the “Security” protocol selected by sliding to the right. Average download speed measured was 258 Mbps, so even with the highest encryption/security level, you will have blazing speeds. Ping in all three tests with or without being connected to the VPN, remained the same, between 9-10ms. UsenetServer is very similar to Newshosting, which offers more for a few pennies extra. Note: Compare top news servers before deciding which one really suits you. With Usenet trials, it’s the smart way of comparing Usenet providers without wasting money. 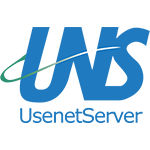 Summary: UsenetServer is a very good Usenet provider. Amazingly fast downloading without data limit and with a very high retention. All of this for a very low price. And from us, you get on top of that a great discount. UseNeXT Review – Is it Worth Your Money? XSNews Review with 30% Coupon – Best bang for your buck? This work is licensed under a Creative Commons Attribution-ShareAlike 4.0 International License. ShareConnector 2002 - 2018.